Super-powered “ghouls” stalk through the night hunting humans for food; the police are largely powerless to protect the people; and a young man finds himself standing between the worlds of predator and prey. It’s a great setup. Too bad the follow-through was lackluster. Last year’s Tokyo Ghoul was an anime that did an excellent job of building a modern-day fantasy—a world where man-eating ghouls exist alongside normal humans. Though there was a lot of action, that wasn’t the focus. 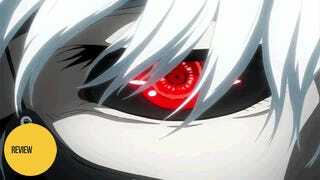 Rather the world—and the half-ghoul Kaneki’s place in it—were the driving forces of the anime. We learned about how the police react to this world full of murderous superbeings as well as explored the various lifestyle philosophies of ghoul society. Tokyo Ghoul’s one major shortcoming, however, was that it ended in the middle of the final battle—leaving the show largely without a climax or resolution. It didn’t even end on a cliffhanger. Instead, it ended before one could happen. Thankfully, the first thing sequel series Tokyo Ghoul √A does is finish up the final battle and tie up the hanging loose ends. The battle even ends on an intriguing cliffhanger as the brutally tortured Kaneki decides to join the villains rather than return with his friends who came to rescue him. While Tokyo Ghoul was clearly Kaneki’s story, Tokyo Ghoul √A is not. It is the story of two groups: the people he has left behind and the police who are hunting the ghouls. Unfortunately in the case of his friends, this means little more than episode after episode of angst—especially in the form of Toka, Kaneki’s love interest. After Kaneki’s disappearance, Toka completely restructures her life to mirror Kaneki’s before his departure: She studies to get into his college and takes care of orphan ghoul Hinami like he used to. She even befriends Kaneki’s best friend. Yet, we never see why she is taking such drastic steps to be closer to him. Presumably it is because she hopes that by becoming more like him, she will be able to understand why he turned to the dark side, so to speak. However, the anime never truly explores the motivations behind her actions. All we see is a once self-assured young woman who has suddenly transformed into little more than a pining, angsty teen—a damsel wondering why her prince has abandoned her but who is unwilling to do anything about it. The police, on the other hand, fare much better in the character development department. In the first season, Investigator Amon was pretty much the only character (besides his deceased partner) to have the benefit of a large amount of screen time. Tokyo Ghoul √A, however, spends much of its time fleshing out the police roster with both new and old characters alike. Amon spends his time developing a relationship with his late partner’s estranged daughter, Akira. Through her we learn was it was like to grow up with two parents fighting on the front lines against the ghouls. But more than that, she clearly wishes to learn about her father through Amon—so it makes perfect sense that she eventually falls for the man who exemplifies the best qualities of her late father. On Amon’s side, he is intrigued by Akira but clearly worries if a relationship with her is the right thing to do. A lot of time is also spent developing Juzo, a nearly psychopathic teen who finds joy in the slaughter of ghouls—even if they are former friends. Raised by ghouls as a pet participating in various bloodsports, he is unable to connect with the human world in a normal way. However, we see that despite this, he is eventually able to form an almost father-son bond with a senior detective. So while crazy on the surface, we little by little are able to understand the mind of this truly deep and complex character. But as interesting as many of the character moments can be, √A suffers greatly in the plot department. As far as story progression goes, very little happens in √A—apart from the grand climax in the last two or three episodes. But even worse than that, most of what does happen has very little bearing on the story’s resolution. Outside of the first episode (which is more a conclusion to the first season than anything else), the first major event in the anime is a jail break where Kaneki and evil ghoul group Aoigiri attack a maximum security prison. While full of action, there is one major problem with this arc of episodes: We never learn the greater reason behind the attack. Sure, we find out the immediate goal is to break out one incredibly strong ghoul and convince him to join Aoigiri; but once the jail break is complete, the prisoner is never seen or heard from again. Also during the jail break, we learn that there are two more half-ghouls like Kaneki—and moreover that they used to be cops. They likewise are never mentioned again. We also learn that Kaneki has been using his position in Aoigiri to feast on ghouls instead of humans. This in turn has made him so powerful he is nearly immortal—but at the cost of being on the edge of turning into a mindless monster. Yet again, this plot point is forgotten entirely by the time the final climax rolls around. The story is also more than a little contrived, with characters making grand, illogical assumptions just so that the series can end with a climactic battle. After a mysterious author meets with the police and tips them off to the idea that some ghouls may run a coffee shop, the police come to the conclusion not only that Toka’s coworkers are ghouls (which they are) but also that they are Aogiri (which they aren’t). Of course, the police never find evidence of either claim but nonetheless decide on a hunch to attack the coffee shop. Moreover, when the coffee shop ghouls find out about this, instead of running away to avoid conflict, they decide to stay and fight the police in a certain bloodbath—despite the fact that they have sworn off killing to the point that they eat the corpses of suicide victims rather than hunt humans for food. Again, this seems more than a little forced as it goes against what we know of the characters but is done all for the sake of an action climax. The final battle itself is simply chaotic, with new characters popping up left and right to battle the ghouls and the actions of many of the characters making little to no sense. And like the last season, √A ends mid-climax, with Kaneki seemingly about to face off with the strongest the police have to offer—and who is a character that has received literally no development. It is as confusing as it is unsatisfying. Tokyo Ghoul √A is a mess of an anime, but I believe there is a simple reason for this: √A is an anime that assumes you have already read the original Tokyo Ghoul manga. Rather than a direct adaptation of that work (like the first season was), √A is an alternate way the manga’s story could have unfolded—a hook to get the manga readers invested. While I have no doubt that √A’s numerous forgotten characters and plot threads were explored in the original manga, to someone like me who has not read it, this anime appears contrived and badly written at best. In the end, while I enjoyed much of the character building the anime has to offer, without a well-structured plot to support it, the whole anime just falls apart. Tokyo Ghoul √A aired on Tokyo MX in Japan. It is currently available for free and with English subtitles in the US on Funimation and Hulu.